Minister of Finance and Planning, Dr. the Hon. Peter Phillips (second left), fields questions from journalists during a press conference held at his National Heroes Circle offices in Kingston, today (August 10) to provide details on the debt buy-back arrangement between Jamaica and Venezuela. Also pictured (from left) are: Chief Executive Officer of the PetroCaribe Development Fund, Dr. Wesley Hughes; Minister of Science, Technology, Energy and Mining, Hon. Phillip Paulwell; and Governor of the Bank of Jamaica, Brian Wynter. Minister of Finance and Planning, Dr. the Hon. Peter Phillips, says the debt buy-back arrangement with Venezuela under the PetroCaribe Energy Co-operation Agreement, was undertaken for the benefit of all Jamaicans and will serve to improve the services the Government provides. The transaction, which was completed last week, is expected to save the country hundreds of millions in debt payment and improve the country’s standing with international rating agencies. A sum of US$1.5 billion was used to purchase US$3.25 billion owed by the Government of Jamaica through the PetroCaribe Development Fund to PDVSA Petróleo S.A., under the PetroCaribe Energy Co-operation Agreement. The money was taken from funds raised by Jamaica on the international capital market on July 23, 2015 to buy back some of the country’s outstanding debt, thereby reducing the total debt stock. Outlining some of the benefits of the arrangement during a press conference at his National Heroes Circle offices in Kingston, today (August 10), Dr. Phillips noted that the country’s debt service will be lower by just under US$300 million over the life of the transaction. 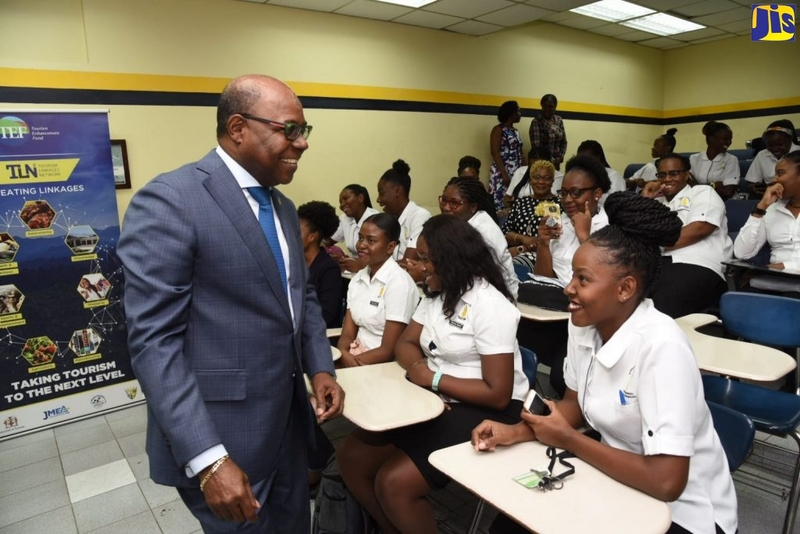 “This applies to the total debt service, that is, the principal and interest to be repaid in relation to the funds raised on the international capital market to purchase the PetroCaribe debt, when compared with the total debt service on the full PetroCaribe debt,” he explained. Dr. Phillips noted that importantly, this transaction is expected to lower the debt to Gross Domestic Product (GDP) ratio by approximately 10 per cent, given the difference in the principal amounts. “These transactions together also allow for a reduction in the nominal public debt stock from $2.1 trillion to $1.9 trillion or $164 billion less. This is contrary to the notion that has been posited in some circles that the Government is increasing the country’s debt,” he said, adding that the arrangement will not require higher taxes as has also been suggested. He further noted that the reduction in the GDP ratio and the improvement in the country’s risk profile means better interest rates, not only for Jamaica but for all investors wanting to invest in Jamaica. “In effect, by purchasing the debt owed by the PetroCaribe Development Fund to the PDVSA Petróleo S.A., the PetroCAribe Development Fund is now obliged to pay the Central Government instead of PDVSA for the full amount of the debt. The payment from PetroCaribe Fund will allow the Government to further improve the services that (it) provides,” the Minister said. Equally important, Dr. Phillips pointed out, is that the money used to fund the purchase of the PetroCaribe debt requires that for the first 10 years, the country only makes interest payments – there are no principal repayments. The further explained that the transaction was based on the net present value of the debt outstanding at December 2014 and represented a very large percentage of what is owed under the programme, but not the total amount. “The remaining outstanding amount attests to the commitment of the Venezuelan authorities to the continuation of the PetroCaribe facility,” he said. Turning to the US$500 million which has been set aside from this transaction for budgetary purposes, the Minister noted that the Government is able to ensure that the 2015/16 budget is now fully funded and insulated from any adverse market conditions which may develop. He said that this allotment ensures that the $62 billion to be paid out on maturing bonds issued under the National Debt Exchange (NDX) in February 2016, is possible. Aimed at reducing the country’s debt stock, the NDX was part of the pre-requisite to signing a US$932.3 million four-year Extended Fund Facility (EFF) with the International Monetary Fund (IMF). Under the NDX, financial institutions and Government bond holders were required to exchange their existing bonds for bonds with longer maturities and at lower interest rates. The principal was not affected. The PetroCaribe Energy Co-operation Agreement, formally established on June 29, 2005, is an oil alliance between Venezuela and 16 other Caribbean and Central American nations, including 15 Caribbean Community (CARICOM) member states, Haiti, and Honduras, to purchase oil on preferential payment conditions. This system allows for oil to be purchased up front at between five and 50 per cent of market value, with a grace period of one to two years to commence making the remaining payments. These can be paid through a 17 to 25-year financing agreement at one per cent interest, if oil prices are above US$40 per barrel.